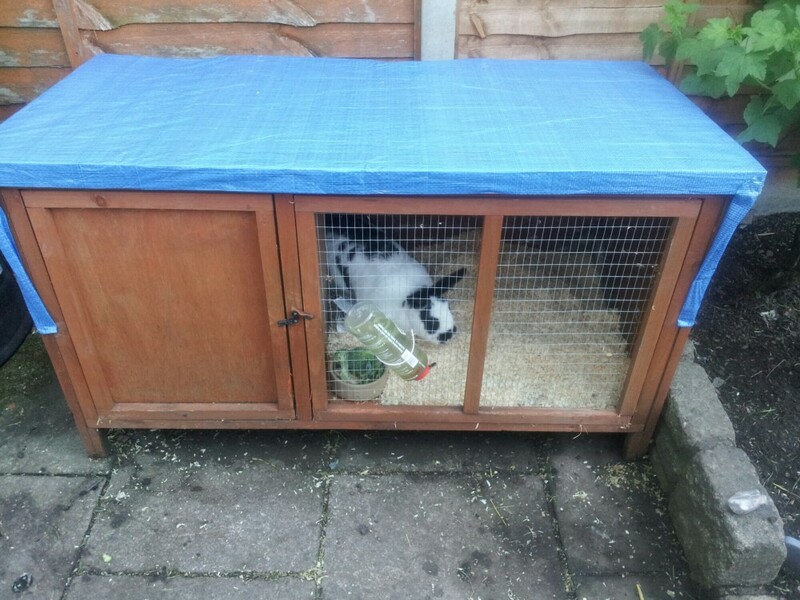 We only bought Patch a new hutch last year and the roof has already failed. Rain water has been leaking in through the roof felt. I can’t afford a new hutch at the moment. So rather than leave it to get worse and Patch to get damp, I’ve come up with a great cheap fix. I bought a cheap large bit of tarpaulin, £5 for approx 2 by 3 meters in a local shop. 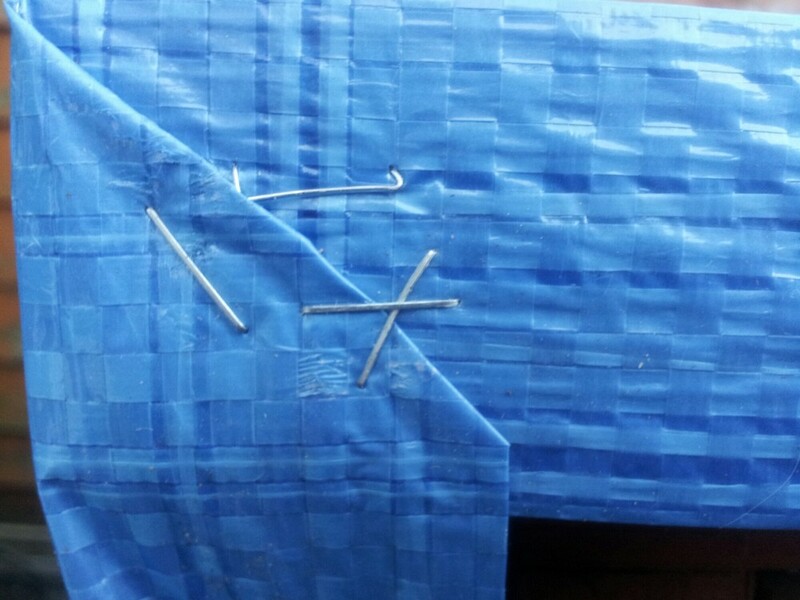 Armed with sharp scissors and a normal stapler I made a new roof (kinda). Think of old episodes of “changing rooms” and the presenter obsessed with re-upholstery and staple guns. Yeah, that! I folded the tarp in half so its two layers thick and began stapling along the front wooden beam of the roof first (above the doors). Then I worked backwards across the roof, keeping the tarp straight and tight. 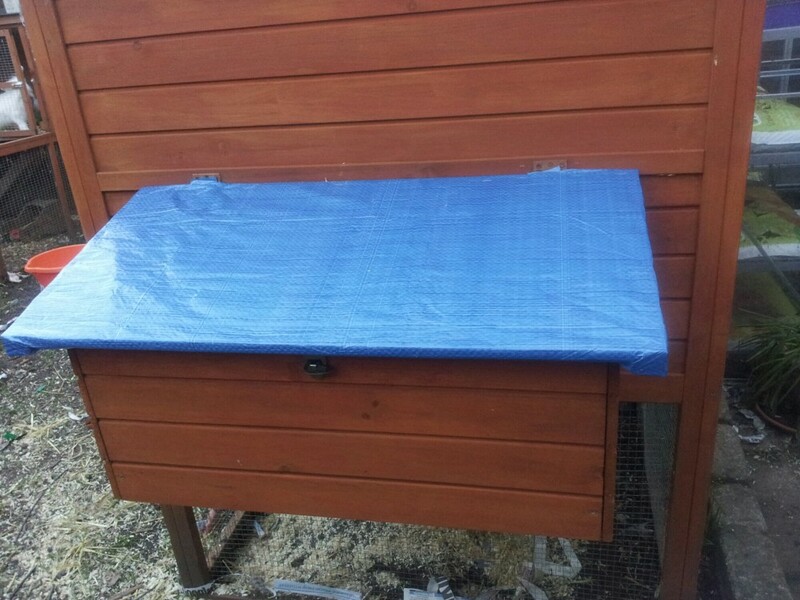 When the roof was covered I folded the excess down the sides of the hutch and stapled it downwards carefully. Looks odd from the back. When the sides were done I concentrated on the back. The back panel of the hutch is damaged too from the roof fault. 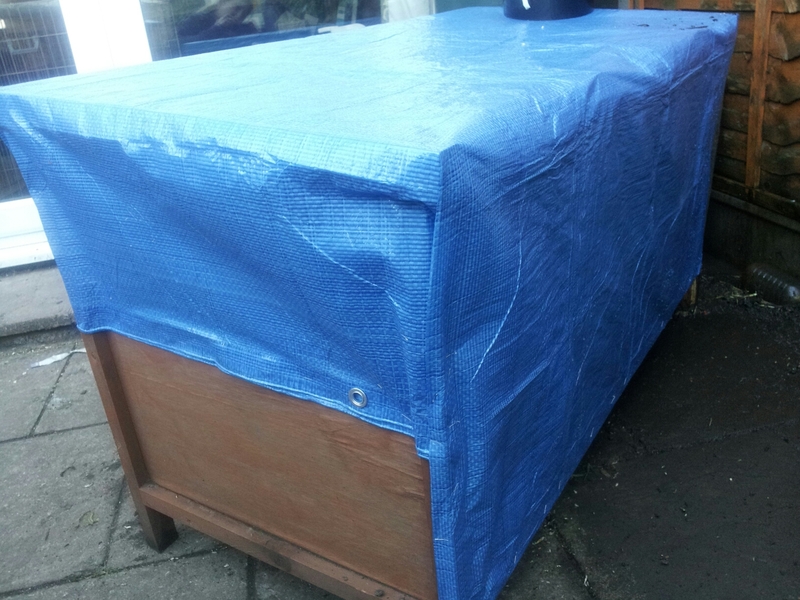 I covered the whole of the back panel, folding the tarp like a poshly wrapped gift. Its important to fold not cut it so that there is not a weak point. Rain always finds the weak spots! Now its just a waiting game until it rains again. I am not expecting 100% water resistance but I think it will stay dry in normal rain, only leaking in thunder storm levels of rain. Well I hope so anyway! I had a bit left so did the roof on the chickens bedroom too. I don’t like the blue but if it works I don’t care. What do you think? Will it work? Do you do things on the cheap too? Its just one bunny in there, old guy Patch. I want it to rain a little now. Looks neat and cosy even if it is bright blue. 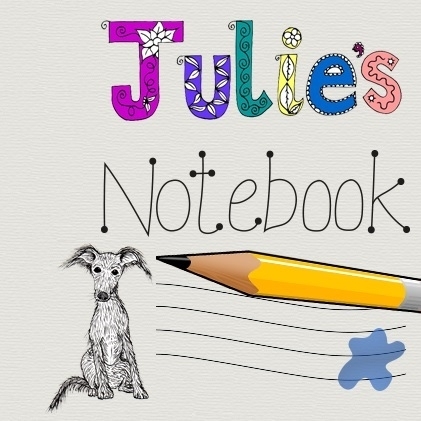 Erica Price recently wrote… Giving It A Go. well done you, looks fab and I’m loving the blue! !Hope it’s worked! Lauranne recently wrote… Friday night isn’t date night.